I would like to start my article for this e-magazine with a request to our readers to enlighten me on the album I am introducing here. 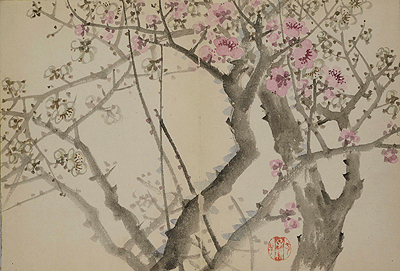 Red and white plum blossom from Nampō Gafu: Album of Birds and Flowers. The book is bound in an accordion fold format and appears to have no evidence or trace of a title strip. In fact the book has no given title, preface or postface. The last page includes a postscript indicating that it was made (not printed, but hand painted) on the ‘First winter of Meireki 4 (1658)’. This date is rather peculiar, for Japan has a tradition of ascribing new era names with the enthronement of a new emperor, and on rare occasions era names were revised following calamitous events. Meireki is a typical example of the latter. On the 18th and 19th of the first month of 1657, or Meireki 3, a raging fire engulfed nearly two-thirds of the Japanese capital city of Edo leaving Tenshukaku—the Edo castle keep, Honmaru, Ninomaru and Sannomaru Palaces in cinders and claiming 100,000 lives. In an attempt to sever association with the fire, the era name was changed to Manji on the seventh month of 1658. This suggests that the first winter (from the beginning of the eleventh month to the beginning of the twelfth month) of 1658 should be Manji 1 rather than Meireki 4. The postscript also states that the art in the album is by Nampo, but despite the librarian’s extensive attempts to recover any reference, no details about an artist by that name could be found. In addition to the handwritten inscription about ‘Nampo’, an impression of a seal reading ‘Shinin Jōchō’ (or possibly read in reversed order as ‘Jōchō Shinin’) is apparent. 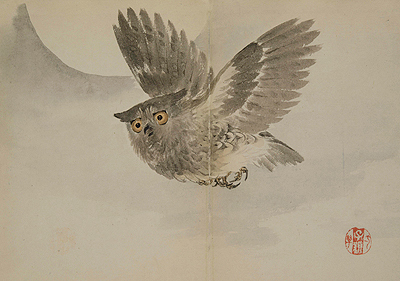 The album contains 16 images of birds and flowers as a spread, together with an image of Mount Fuji on one page leaf. The style is reminiscent of Tosa school brushwork, though as a librarian I defer aesthetic judgement to the trained eyes of an art historian. A seal that appears as ‘子頼/○○…(‘Shirai’) is on each image, but the text is not clear enough to be certain of its meaning. The album is a relatively small book measuring 18.8 cm high and 13.6 cm wide, with an elaborate binding. The book is covered in what seems to have been a bronze/gold woven silk with a five-leaf bamboo design. The cover is lined with a thin layer of wadding and a light indigo paper with gold flecks is used as end papers. The top, bottom, fore pages and the spine of the book are painted in gold. Although the silk covering the corners of the book is worn, there is no sign of excessive handling of the album or its pages, which suggests that it was kept with great care. Who Nampō is and why he painted the album remain unknown. If anyone has further information, I look forward to hearing from you. As a side note, a new publication by the donor of the book, Sir Hugh Cortazzi, who is interviewed in this e-magazine, will be published in December this year, and Sir Hugh will be giving a Third Thursday lecture on this publication. The book includes many images from Nampō Gafu and the Institute’s Christmas card will also feature an image from the album.